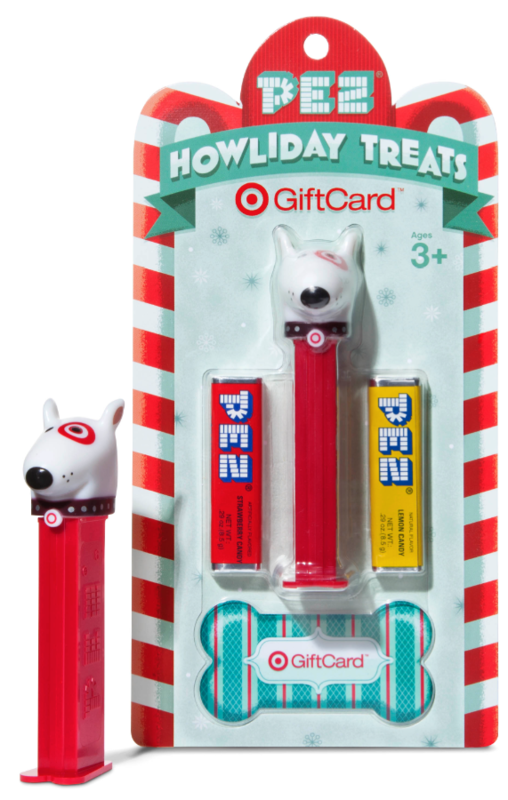 The holidays are all about tradition and making memories — two things that Target and PEZ know all about. 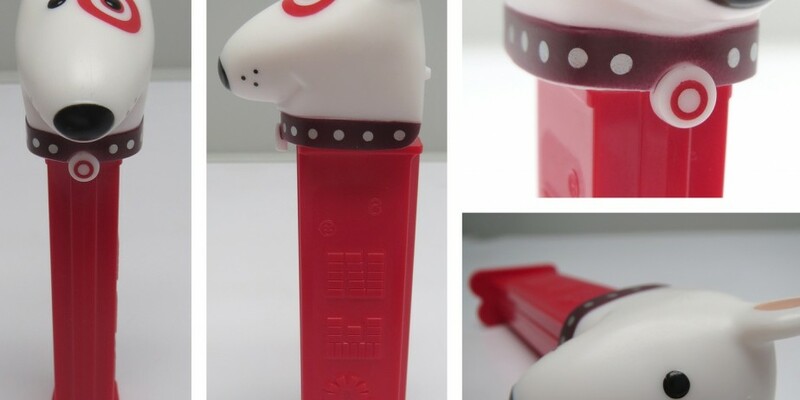 The two storied companies have teamed up to create a Target-exclusive PEZ gift card, complete with a custom Bullseye dog PEZ dispenser (with candy!) and a bone shaped gift card. Developed as a breath mint in Vienna by Eduard Haas III, the name PEZ is essentially an abbreviation for “pfefferminz,” the German word for peppermint. For collectors and casual fans alike, PEZ dispensers conjure up fond recollections of favorite characters and personalities. Naturally, Target jumped at the chance to have Bullseye placed among the ranks of superheroes and storybook characters that have graced the tops of these iconic dispensers. To craft the perfect product, seasoned Target gift card designer Don Clark created five rounds of sketches before the winning illustration was chosen. It was then shipped off to PEZ where they created a 3D rendering and began sculpting. The rest, they say, is holiday magic! We sat down with Joe Vittoria, the CEO and president of PEZ Candy, Inc., to ask about his favorite PEZ flavor and when his very own collection began. How many different PEZ dispensers are there to date? Are you a collector? We believe there are thousands, but it depends on your definition. Over the years we’ve made several versions of thousands of different characters. This doesn’t even factor in the varied paint schemes. In other words, there are a lot! One day we will count them all. As for me, I was an unwitting collector. I hate to admit it, but when I was five or six years old, I would stop at the store on my way to Sunday church services to buy a PEZ dispenser with some of the money my parents gave me for the donation box. Before you knew it, I had drawers full of them! When I got older, I realized I associated memories with each dispenser. I guess you can say I was an unofficial PEZ collector, but was really collecting memories. What is your favorite PEZ flavor? This quote from “Stand by Me” pretty much sums it up: “If I could only have one food for the rest of my life? That’s easy—Pez. Cherry flavored Pez. No question about it.” I also really enjoy the orange and chocolate flavors we produced a few years ago. A rendering of the Bullseye PEZ dispenser. Do you have a favorite PEZ dispenser design? Now that’s a tough question, but if you twist my arm I would have to admit that Santa Clause has always been one of my favorites—it brings back so many memories. What is PEZ’s design philosophy? It’s simple – we try to produce fun products that create memories. Sometimes a design is driven by a pop culture character or by a theme. We have worked with inspirational brands and movie companies for more than 60 years. Many have said, “You’re not famous until they put your head on a PEZ dispenser.” We pride ourselves in our quality and attention to detail in capturing the feeling of a character. Over the years, a vibrant global collector community has blossomed and we produce sets for our consumers with collectors in mind, but more importantly each dispenser has a story. Target and PEZ are two iconic brands. Was it fun to bring them together for this gift card? We are very selective when choosing partnerships because we want something that inspires memories and carries a tradition. 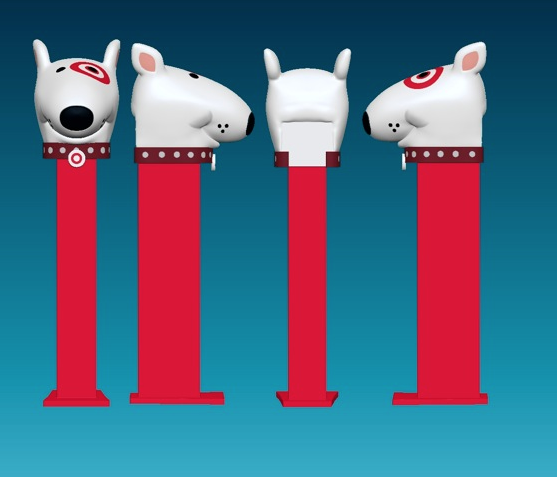 Teaming up with Target and incorporating the iconic Bullseye dog is a great way to recognize the tradition Target has brought to its guests. I truly believe this gift card pack will create memories for years to come. Creating this one-of-a-kind dispenser for Target was a project based in fun. We got to see firsthand how much Bullseye means to the Target team and its loyal guests. What do you think the two brands have in common? It is clear that Target stands out among retailers and has created a deep connection with their guests. Target demonstrates a contemporary approach to consumers’ ever-changing needs but never forgets tradition and the fun that keeps them coming back. Those rare qualities resonate with PEZ as well and will always be as much a part of our future as they have been of our past. In addition to the delightfully adorable PEZ gift card, Target has unveiled 12 other new Gift Card designs this holiday season. Target Gift Cards purchased in-store can be loaded with any amount up to $2,000. Learn more about the design of past gift cards and browse our favorites from the vault!